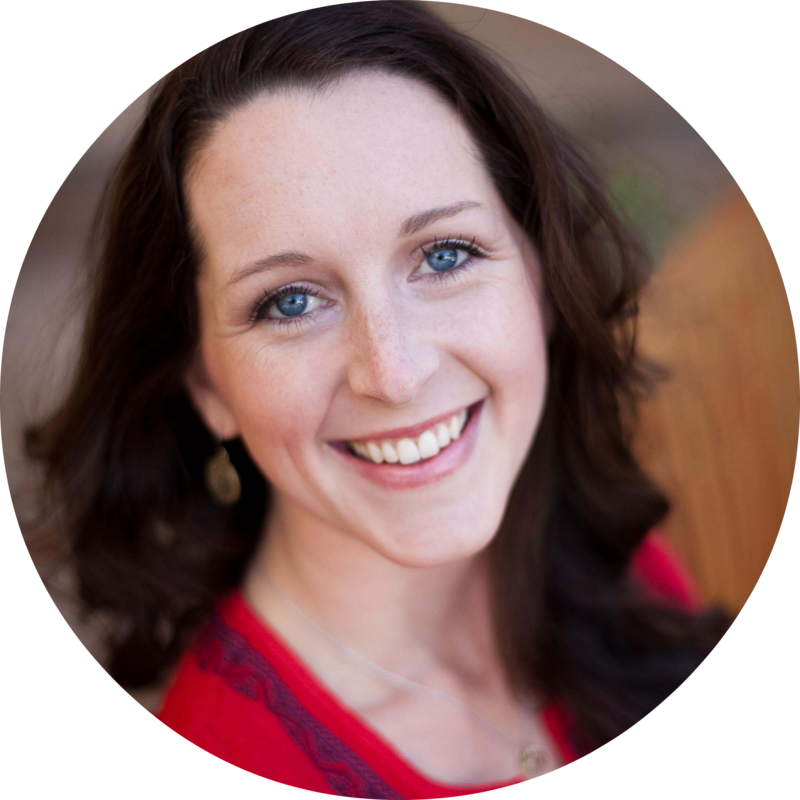 This post is by Sarah Powers. The start of school for two of my three kids (my 3-year-old starts preschool this year, too) has me uncharacteristically enthusiastic about home organization projects and even a little crafty DIY. Yesterday this manic energy led me to Pinterest, where I searched for printable morning routine charts. I didn’t need a complicated checklist with room for stickers and stars – just a simple list with images for pre-readers to guide us through our morning. 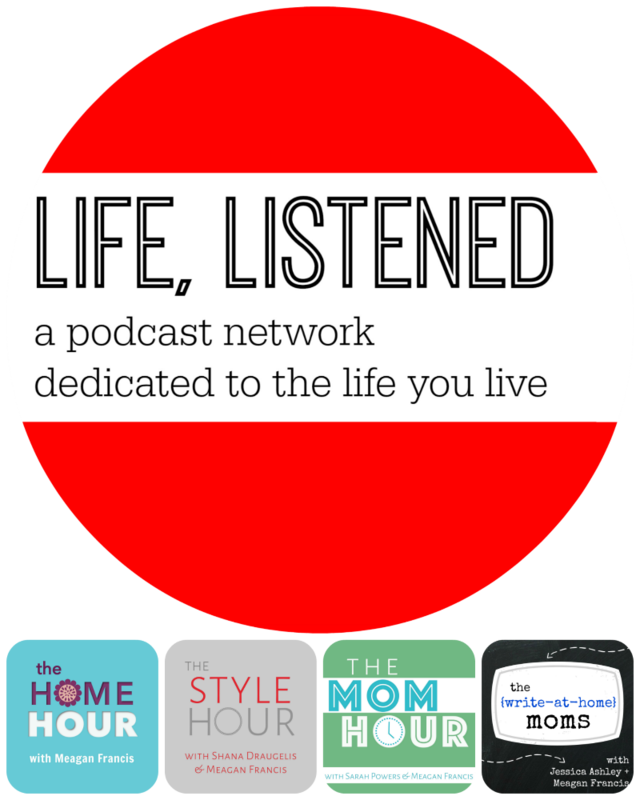 Pinterest led me to this post by IHeart Organizing. 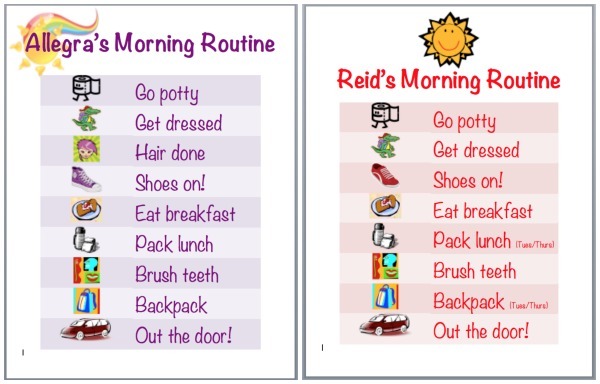 The free printable morning routine and bedtime routine charts Jen has on her site are just lovely. Simple, pretty, free, printable. Really, you should check them out. But, of course, I had this urge to customize. Jen’s chart included almost all the morning routine steps I wanted, but they were a little out of order for our morning routine, and I had a couple of additions I wanted to make. So I decided to make my own. I spent about 15 minutes making the first one for my daughter, and another 5-10 customizing it for my son. The kids got to help choose the colors and icons for their chart, which made it fun (and, hopefully, achieved some buy-in for the routine itself). Open a new document in MS Word (Excel could also work, as would another word processing program – we used MS Word). Create a table with two columns and as many rows as you have steps in your morning routine. Populate the fields in the righthand column with your chosen steps. We did ours roughly in the order they happen in the morning. Need help creating a table in Word? You can start with my template – download it by clicking here. Once your table is populated, play around with the size of the font and style of the table until you’re happy. My version of Word has a bunch of pre-set templates to choose from. Ed: I’ve updated this part of the post because the online library of free clip art from Microsoft isn’t available anymore. Bummer! 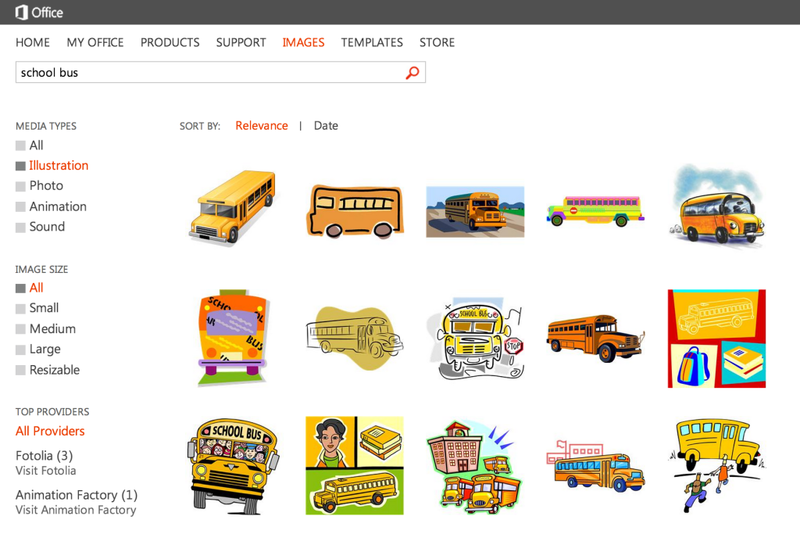 After a little research, this OpenClipArt.com site looks similar. The steps below will still work, no matter where you get your free clip art. Type in search terms for each of your line items. This is where I let the kids choose their own icons (suppressing the urge to make sure they all matched and hopefully earning for myself some future morning compliance as a result). Hence the random Alligator for the “Get dressed” step. 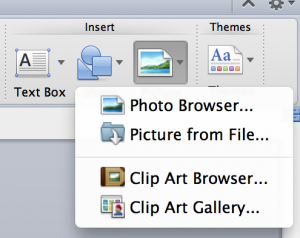 Download each clip art file separately, making a note of where you save them. 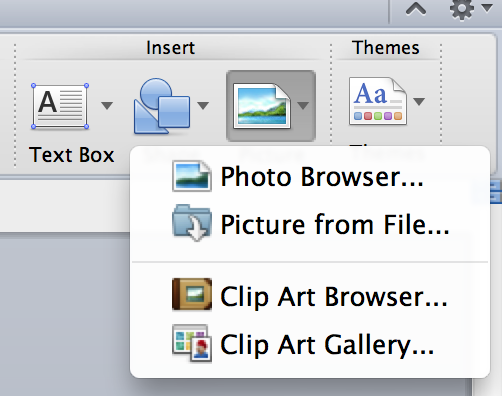 Navigate to the folder where you saved your clip art files and find the image that matches the step in your routine. Insert it into the table field; resize and reposition as necessary. Repeat for each line in the table. At the top of your Word document, add a title with your child’s name. I also let each of my kids pick one more clip art icon to place at the top. We used each of their favorite colors for the font and table shading to make it even more their own. 5. Print, protect & display! I printed ours on our home printer. While a laminating machine would be awesome, my nesting energy doesn’t take me quite that far. I did find some leftover binder protector sheets in the office that will do the trick. We will be displaying our routine charts both upstairs and downstairs (since the first few steps take place upstairs and the rest down). Here they are on the fridge. Note #1: if you’re curious about my wall calendar, I talk about it (and my calendaring system) in this post. Note #2: ultrasound photo of my six-month-old and Santa-at-the-mall picture clearly have not fallen victim to manic nesting update-and-organize-all-the-things energy. YET. If you’re looking to make a routine chart of your own, this approach worked great for me. It’s not as gorgeous in design as some, but it’s customized to my kids and my needs, it was free and easy to make, and they even got to help. 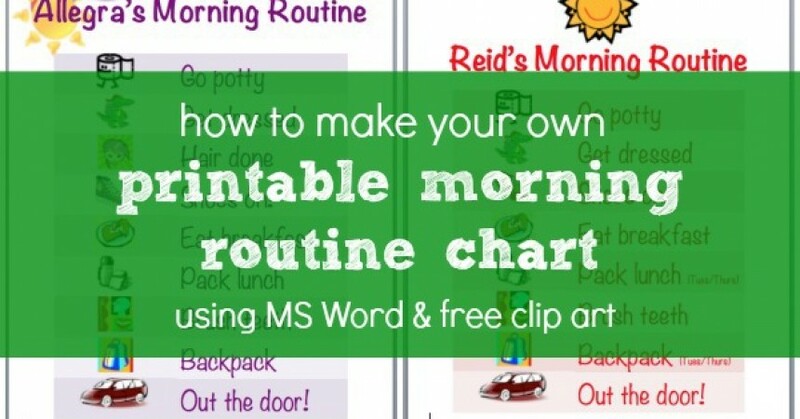 Now tell me: do you use a routine chart in the morning? Do you get back-to-school-nesting syndrome too? Great idea!! I’m definitely going to customize my own, maybe make a spot for stickers so they can get one when they’ve done it all! THANKS! Oooh, magnets! I like that – thanks Michele! Bookmarking this to come back to in a day or so! 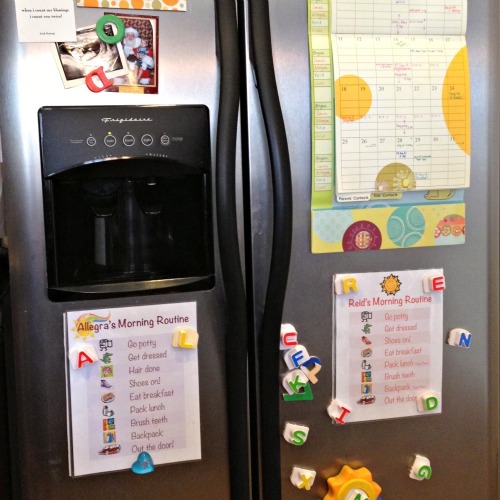 Great idea for hectic mornings! We use the same idea for bedtime routines because my 6-year-old daughter had a habit of using every excuse in the book to get back out of bed (what kid hasn’t?) Duties include pajamas, brush teeth, get a drink, potty, read a book, and we added hugs & kisses. If the child doesn’t call out for mom or get up at bedtime, they also mark that off the following morning. Bedtimes were sometimes stressful and dragged on for far too long when the parents are already worn out from the day. She loved the responsibility of checking off the bedtime tasks herself, and bedtime has been much easier ever since! Carla, I totally made one of these for bedtime, too. Agreed – so much easier (and our list looks much like yours). 🙂 Thanks! How can i begin to build or make my kids rountine schedule on MS Word or what?? Can’t find the download for free ? Thanks for the post and the template. I cannot work out tables to save my life. I now have 3 new visual routine charts, two for our different mornings and one for night time. My daughter will be in 1st grade so this will help us a lot! By the way, what font did you use? Thank you. Thank you so much for posting this, it’s exactly what I’m looking for. I’m exhausted every morning after it takes us 2 hours to get ready and get out of the house! Time to get organised. 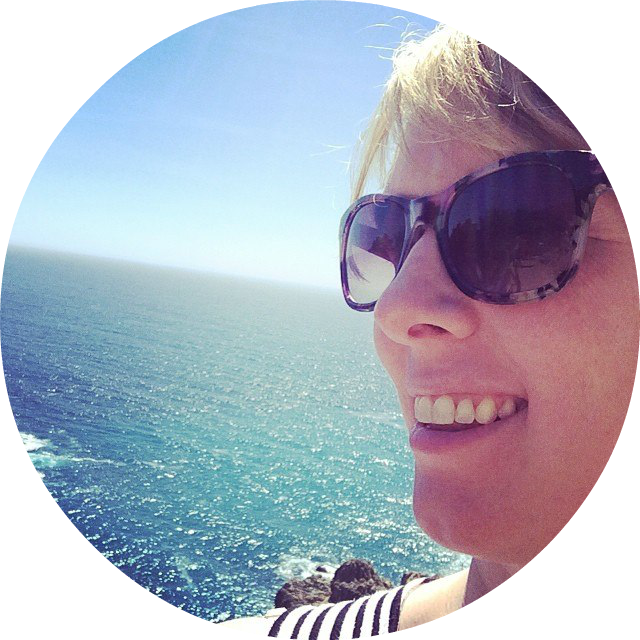 Follow-up – thanks again Sarah, I made up both morning and evening routines (after a big fight with MS Word!) and the kids love them. My 3 yo was concerned that the picture only showed one shoe. My 21 mo was not happy that his one shoe was blue and not the brown that he wanted to wear 🙂 We were able to get ready in 1.5 hours today – i know it’s still not great but it’s a big improvement even on yesterday. Thank you! !